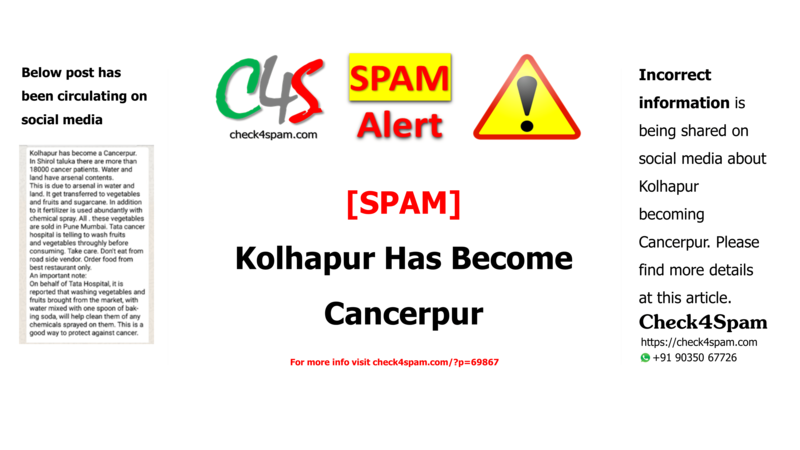 Incorrect information is being shared on social media about Kolhapur becoming Cancerpur. Please find more details at the verification section of this article. Kolhapur has become a Cancerpur. In Shirol taluka there are more than 18000 cancer patients. Water and land have arsenal contents. This is due to arsenal in water and land. It get transferred to vegetables and fruits and sugarcane. In addition to it fertilizer is used abundantly with chemical spray. All these vegetables are sold in Pune Mumbai. Tata cancer hospital is telling to wash fruits and vegetables throughly before consuming. Take care. Don’t eat from road side vendor. Order food from best restaurant only. On behalf of Tata Hospital, it is reported that washing vegetables and fruits brought from the market, with water mixed with one spoon of baking soda, will help clean them of any chemicals sprayed on them. This a good way to protect against cancer. Verification: The fear of cancer in the district is baseless. People in Shirol Taluka of Kolhapur district are scared of getting affected by Cancer due to the misinformation spreading.It is very obvious that a person takes a back upon hearing the word Cancer. The fact is we don’t know the full information about the cause, symptoms and prevention. Due to this misleading message, Shirol Taluka people are disturbed. To make everyone clear about it Kolhapur Cancer Center Director Dr. Suraj Pawar spoke at a seminar on ‘Cancer-Myth & misconception’ organized by the Public Health Vigilance Committee. Pesticides have not been proven anywhere in the world as cause of cancer. After this campaign the number of patients were reduced from Shirol Taluka. He said that Tata Memorial Hospital, Kolhapur Cancer Center and Zila Parishad will soon start special screening campaign for cancer in Shirol Taluka. Read More. No cause for cancer has been proven to date, that doesn’t mean pesticides are NOT A CAUSE ! It merely proves the pesticide & chemical industry is very powerful in America, Just like the tobacco industry was! Mr Bhakt, Thank you for your input.